PETER HAMES climbed down to the little farmhouse which he had been sketching from the side of a near-by hill. To his surprise, he found quite a large group of people gathered in front of the house. A man in the alien habiliments of civilized places was standing on an old wagon, facing a score of villagers; and seated on the doorstep of the house was a man in blue overalls, his head sunk on his chest, his fierce, light-colored eyes wandering here and there, with a look of hatred for everybody. Men were dragging out articles of furniture from the house. Peter Hames, gazing over the dilapidated gate, idealized that he had stumbled upon a sale of household effects, that the man upon the wagon was the auctioneer and the man upon the doorstep the probable victim of the law. He pushed the gate to one side, and approached the outskirts of the gathering—a strange figure to the wondering villagers, for he was dressed in very shabby brown Holland shorts, a blue shirt open at the neck, a pair of brogue shoes, a sun helmet, and very little else. The auctioneer leaned from his wagon as though to question him. Peter Hames removed his helmet with meticulous politeness. "I am a wayfarer by accident," he explained. "It is perhaps a sale which takes place. I do not intrude?" "For today," the auctioneer confided, "this garden is the property of anyone who cares to enter, and if monsieur has a few francs to spend, there might perhaps be bargains." The man with the queer-colored eyes and yellow beard scowled across at Peter Hames. "Is everything out of the house?" the auctioneer asked, a few minutes later. "Everything except the bed upon which my poor wife lies," the man upon the step replied, "and the person who lays a hand on that will get his neck broken for his trouble." They looked at him strangely, all that crowd of people, and it was easy to see that, although he might have lived amongst them for a year or more, he was not one of them, either in class or race. The auctioneer shook his head at the belligerent speech. "It is never a pleasure to us who follow my profession," he declared, wielding the little cane in his hand, "to dispose of the household goods of any man—least of all of one with whom one has some acquaintance. The law is the law, however." A strongly built but fat man in dark clothes, and with weather-tanned skin, who in his somber way seemed to be dressed for a fê te, pushed his way to the front. "I will save you time if you will, Mr. Auctioneer," he volunteered, speaking with the well-assured air of one accustomed to command. "As all my good friends here know, my son Guillaume marries tomorrow Anna, the daughter of our neighbor. Without furniture, Monsieur Froydshen must vacate his premises, even though his tenancy has not yet expired. I propose to establish my son here, and I offer you, Mr. Auctioneer, five thousand francs for everything that you see. It is an offer seriously to be considered." MEN and women alike began to chatter. The suggestion of their wealthy neighbor was very little to their liking, for each had squeezed a few francs from his stocking for bargains. "What can one do?" the Widow Marose muttered. "The second bed I needed, and the linen, too, such as it is, but how can one bid against a man of wealth like Jean Bourdaut, the merchant of timber?" The auctioneer cleared his throat. "My instructions would not allow me to sell in such a manner, much though I should prefer it," he regretted. Peter Hames crossed the narrow space of weedy gravel, encumbered now with a medley of domestic articles, and approached the man who was seated on the doorstep. "Aren't you Froydshen?" he asked. "Haven't I met you once or twice at St. Paul with Pierre Meisonier and his friends?" "Yes," the man acknowledged, "Froydshen's my name. I remember you." "Sorry I seem to have stumbled in upon a little trouble," Peter Hames continued. "I had no idea what was going on; I have my easel pitched upon the hillside back there." "You should paint this, if it's in your line," the other suggested bitterly. "How did it come about?" Peter Hames inquired. "Sick wife, drink and laziness, and I suppose want of talent. I can't ask you in, because I haven't a chair for you to sit on, or a glass of wine to offer you." A WOMAN'S faint voice called from an upstairs room, and Froydshen leaped to his feet and hurried away. Peter Hames joined the rest of the company. The bidding for the bedstead had commenced. "At twenty-five francs it is perhaps finished?" the auctioneer queried. Jean, the timber merchant, was standing well out in front of everyone, grasping his roughly cut stick, and looking around him with a challenging air. Jean, the timber merchant, had many irons in the fire, and no one wished him for an enemy. "Fifty francs," Peter Hames offered firmly. There was commotion, evidenced at first by a pregnant silence, then by an outburst of exclamations. Monsieur Jean went over to the bed, poked it about, shook it, and turned away with a grimace. "A miserable affair," he pronounced. "Nevertheless, I bid fifty-five francs." Jean, the timber merchant, glared across at his opponent. "It is, in effect, your intention to buy the bed?" "It is," the latter acknowledged. "Then buy, if you have money enough to pay for it," Jean shouted angrily. "For the first, second and third time, then," the auctioneer continued, "since Monsieur Bourdaut has withdrawn, the bid is with the gentleman there for seventy francs. Going—going—gone! The affair is concluded." Peter Hames counted out seventy francs from his pocket and seated himself upon the bed with a chuckle. He could see that both the auctioneer and the timber merchant were of the opinion that the seventy francs had practically exhausted his store. He had not the air, in that pair of shabby shorts, and attire generally disreputable, of carrying money. He himself, however, was pleasantly conscious of that very much thicker than usual pocketbook nestling close to his skin underneath his shirt. An old Provenç al dining table, which had a certain genuine value, was brought out. Jean Bourdaut struck it deprecatingly with his stick. "A poor piece of wood," he declared. "I, who am a judge, should know." "Then it is probably not worth more than a hundred francs," Peter Hames regretted. "Shall we start it at a hundred francs, my friend on the wagon?" Once more commotion, excited exclamations and protests! Eventually, the table was knocked down to Peter Hames at two hundred and fifty. Jean, the timber merchant, choked down his rage, and decided to adopt different tactics with this mad Englishman or American, or whatever he might be. "You do not want this furniture, monsieur," he protested. "Of what use is it to you? It is not of the antique design valued so much by your countrymen." "It is an open sale," Peter Hames pointed out. "I enjoy bidding. I like this furniture. As to what I am going to do with it, that is my own business." The great man of the neighborhood was beside himself with fury. He whispered once more with the auctioneer. "There is but one thing in the house worth real money," the latter confided. "Supposing I put it up now. It will cost you dear, perhaps, Monsieur Jean, but you will still be able to sell at a large profit, and if he buys, it will take all the money he has." Jean Bourdaut grunted unwilling assent, and a beautiful, carved Provenç al sideboard was dragged out. Peter Hames examined it carefully. The timber merchant cast a single contemptuous glance at it and turned away. "That piece of furniture," Peter Hames acknowledged, "I like. I like it very much indeed. I bid five hundred francs." "Six hundred," the timber merchant growled. "Ah, I see our friend is in earnest," Peter Hames smiled. "Let us face this matter in a businesslike spirit then. One thousand francs." Everyone began to talk at once. Now, as very often happens in a small neighborhood, Monsieur Jean Bourdaut, the merchant of wood, although he appeared to be the most popular person whenever he walked the streets of his native village, or even the thoroughfares of Grasse, where he had many friends, had in reality contrived to incur a great deal of secret enmity. There were many who had suffered from his grasping methods of doing business, and there was also to be taken into account the invincible jealousy of the French peasant for his rival who acquires wealth where the other fails. Consequently, a great many of the loiterers at the auction that afternoon were already hiding their faces to conceal their smiles. THE auctioneer knocked the piece of furniture down formally, and Peter handed across a thousand-franc note. There were a dozen hands now, having seen the way things were going, ready to help him move the sideboard, which was soon ranged by the side of his other possessions. Jean Bourdaut had walked to the gate, and was looking anxiously down the road. The auctioneer sent a messenger to recall him, but the latter was received with a cut across the shins which sent him howling away. Six very decent chairs, a sofa, a carpet, and an ottoman were added to Peter Hames' possessions. He sat upon the table in the midst of them all, and made a grimace as he saw a nondescript assortment of china, cutlery and kitchen utensils coming along. His enemy was still at the gate. "If this affair is becoming wearisome to Monsieur the auctioneer," Peter Hames suggested at last, lighting a cigarette, and courteously offering his case to the official, "I have an idea. There are four or five canvases there, leaning against the wall. Now if our friend Froydshen's work has not deteriorated, it is just possible, if you take them next, I might be able to buy them at such a price that the rest of the sale would be unnecessary." "There is a long way to go," he pointed out, "before one arrives at fourteen thousand francs." 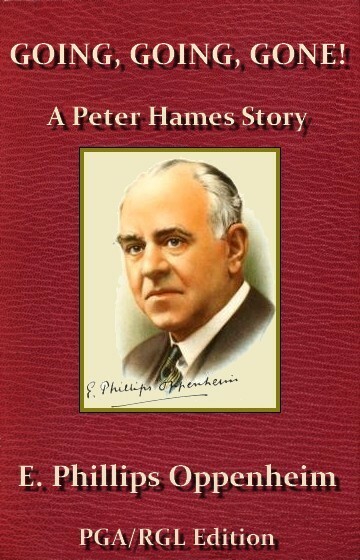 "I get your point," Peter Hames conceded, "but I have a great deal more than fourteen thousand with me, as it happens, and, furthermore, I can give you a check which any banker in Grasse would honor if necessary. You realize the position, monsieur? I am determined to spend as much as will pay off this absurd debt. What I am going to do with the furniture afterwards is my own affair." THE auctioneer looked despairingly at the bulky and furious figure of the man at the gate. "What can one do?" he asked the heavens. A tradesman of the village, who was also a café proprietor, and a man of some substance, intervened. Jean Bourdaut was well out of hearing. "Monsieur the Auctioneer," he said, "the sale must proceed according to advertisement. There are articles here we others desire." The auctioneer drew a little sigh of relief. At least there was someone among the buyers who had insisted that the law should be carried out. His responsibility was no longer a single one. "We will deal with the pictures," he announced. One by one they were handed around. The little group of peasants gazed at them spellbound. The prevalent sensation seemed to be one of stupefaction. Peter Hames' heart, as he, too, joined in the inspection, momentarily failed him. Then there arrived the canvas of an unfinished twilight landscape—the valleys below St. Paul glimmering in the fading light, pin pricks of fire studded in the darkening sky. "Proceed, Mr. Auctioneer," he begged. "Proceed, I beg of you. There is good money waiting here for one at least of those pictures." "Monsieur," he suggested, "will perhaps start the bidding." "I will not insult the artist by offering less than a thousand francs for this picture of St. Paul." The auctioneer looked round at the circle of blank faces. "The picture is yours, monsieur," he announced, after a few moments' unbroken silence. Peter Hames crossed the open space, picked up the canvas carefully, and set it upon his recently acquired couch. "Mr. Auctioneer," he proposed, "I gather that there are no other picture buyers in the place. There are three more canvases. It has long been my desire to possess some of the works of Monsieur Froydshen. Put them together. Let us say two thousand five hundred francs for the lot." Suddenly, his strangely colored eyes aflame with anger, Froydshen strode out of his house. Some rumor of what was happening had reached him. "What is this?" he demanded furiously. "You are a painter yourself. Why do you buy my pictures?" "Because, being a painter, I know good stuff when I see it," was the suave reply. "I liked your pictures when I saw them at St. Paul, and if you weren't so damned lazy about finishing them off, you'd have had dozens of people trying to buy them." Jean, the merchant of timber, having regained some slight measure of composure, came striding back from the gate. "Enough of this pantomime!" he shouted. "Get on with the sale, Mr. Auctioneer. You know who I am—Jean Bourdaut. I am somebody of account, am I not? The stranger there has demanded that you sell the pictures. Very well, he has had his way. Now I say, sell the rest of the furniture, sell it en bloc, if you like." "It is an idea," the auctioneer, having it very much in his mind to keep friends with Jean Bourdaut, agreed. "What does our other buyer say, who has honored us with his patronage today?" "Put it up en bloc by all means," Peter Hames assented. "I get poorer every minute, but I acquire property." Froydshen walked up to him. "What the devil are you doing here, Peter Hames?" he growled. "Is it out of charity you are buying my pictures and my furniture?" "Don't be a fool," Peter Hames enjoined cheerily. "I like your pictures. I've a perfect right to buy them, and I've bought them for a song, too. I've bought the furniture because I'm having lots of fun with that old timber merchant—and I'm going to have more before I've done with him. I have a perfect right to amuse myself as I like. Go and sit with your wife, old chap, and tell her not to worry." The man broke down. He pretended to be examining the table against which he had been standing, but it was very obvious that all he wanted at that moment was to keep his face hidden. The auctioneer banged with his little cane against the wagon wheel. The remaining pieces of furniture had been dragged out. "There are thirty-two lots here," he announced. "Examine them, you who are interested, before I open the bidding." "Five hundred francs for the lot," the timber merchant roared. "Try five thousand, you old thief," Peter Hames bellowed back. "Rascal!" Jean exclaimed, striding toward the hated intruder. "You come here to rob honest men and prevent them from providing their sons with furniture. You bid five thousand for that lot of rubbish!" "You must not call me names," Peter Hames warned him reprovingly. "I might forget that you are a much older man." JEAN, the timber merchant, raised his stick. Then he met Peter Hames' eye, and he dropped it again. "Five thousand!" he spluttered. "From what asylum have you escaped?" "You don't think the things are worth it?" Peter Hames queried. "Leave them to me then. I want them." Jean, the timber merchant, was a man of words and much bluster in the company of pygmies. In the presence of Peter Hames he collapsed. "Let me have what is left for six thousand," he begged. "It is to set up two young people in their new home. Six thousand is an outrageous sum, but I will give it." "Bid your six thousand, and I make it seven. Between ourselves, I am an obstinate man. Bid your ten, and I will make it twenty." That was the end of the local Croesus. He had neither temper nor courage left. He was a beaten man. "The furniture," the auctioneer announced, "is yours, monsieur, for five thousand." Peter Hames rose, and handed the money to the auctioneer. "Are you sure there is nothing else left to sell, Mr. Auctioneer?" he asked. "There is one old chest which has been forgotten," the latter replied, signaling to a porter. It was brought out from the house—an ancient chest of battered iron, of no particular value save for the amazing metal work of the lock. Peter Hames examined it curiously. "Do you know anything about this?" he asked the auctioneer. "Nothing at all except that it belongs to the goods to be sold." Peter Hames examined it more closely. Then again, whilst he bent over it, the silence of the still afternoon was broken. Up the rude track which led to the farmhouse one could hear the galloping of a furiously ridden horse. The little crowd of peasants rushed in a body to the hedge. There was something terrific in the sound of those pounding hoofs, something wildly suggestive of human energy, effort and passion. PETER HAMES dropped the chest and hurried off to join the rest, who were crowded together around the gate, looking over one another's shoulders towards the bend, barely a score of yards away. Even as the horse—a great stallion—came into sight, they could hear its wheezing and groaning. They saw the blood at its mouth, as, with head low down, it came tottering but still straining with every muscle. The horseman rode without saddle or spurs, bare- backed, but with a cruel whip in his hand which he was still using freely. When yet a dozen yards away, the great animal stumbled, went crashing into the hedge, and lay there, his hoofs helpless in the air, his eyes bloodshot. The rider fell on his side into the road, but was up again almost immediately. A mass of black hair was matted over his face, white as death, notwithstanding the burning sun. There was blood upon his lips—either he had bitten his tongue or broken a small blood vessel. He staggered on towards the gate. There were dozens around him now. "The sale!" he faltered. "The sale at Le Manoir!" "Just over," the auctioneer replied. "Who are you?" "There was a chest. Is it sold?" "It is," the auctioneer announced, "under the hammer at the present moment." They helped this man, who had made so dramatic an appearance, into the garden. He said nothing to anybody, but his eyes were hungrily fixed upon the chest. Others led his horse in, and tethered it. Peter Hames slipped into the house, and called softly to Froydshen. There was a look in the man's face which made him keep his own eyes averted. "Look here, old chap," Peter Hames asked, "what the devil is in this iron chest that you've sent out to be sold?" "I have no knowledge of its contents," Froydshen answered. "I bought it because of the lock. It is the most beautiful lock I ever saw, but there is no key." "How do you open it then?" "You do not. It is too beautiful a lock to break. The man who broke it, even if the box held gold, would be a Goth." "Put up the chest," he said to the auctioneer. The latter mounted his wagon. "I'm getting poor," Peter Hames confessed, "but I'll start it at five francs." The last arrival—the man with the raven-black hair, terribly tired eyes, and bleeding lips—leaned forward. "A thousand francs!" he said. "Now," Peter Hames sighed, "I am up against real competition. Very well, my equestrian friend. We will not descend in the scale. Fifteen hundred." "Two thousand," was the hoarse response. There was the dawning of a look of horror upon the face of the rival bidder. He dabbed at his lips. "Got him," he murmured to himself. "Five thousand." To the end of his days—and life was to bring him in the future, as it had done in the past, many adventures—Peter Hames never again saw such a look of despair as convulsed the face of the man who sat opposite to him. He half rose to his feet. His fingers pawed the air. "You don't want it," he cried. "It is nothing to you. You cannot give five thousand." "You look at the lock," Peter Hames advised him pleasantly. "It's quite worth the money." Then he hated himself, because he felt that he had been a brute. Almost he withdrew his bid. A shivering sense of pity robbed him of all the exultation of success. The man had risen to his feet. He was staggering away. For a moment it seemed that he was sobbing. Someone brought his horse, still quivering but unhurt. He mounted, rejecting all offers of assistance, and, with a truly marvelous seat, walked the great beast down to within a yard of where Peter Hames was standing. His left hand stole out. First to the chest he pointed, and then to Peter Hames. And with that he rode away. Peter Hames spent most of the next day in his studio, with the chest upon a table by his side, going through his small collection of volumes dealing with the metal designs of the Renaissance period and before. The more he studied the exquisite lines of the wonderfully fashioned metal around the lock, the more he marveled. He wondered whether the offer of a fortune would produce the key. THE telephone bell rang and, as he listened, Peter Hames forgot all about his chest. It was Sybil Christian talking. "Are you at home tonight?" she inquired. "Why, are you coming to dine with me?" he asked gladly. There was a certain hesitation in her tone to which he was unaccustomed. She seemed almost ill at ease. "I want to come after dinner," she replied. "I don't want to come a minute before eleven o'clock, and I want to bring a friend with me, whose name I am not going to divulge." "You will be welcome under any circumstances at any hour, and you can bring whom you like," he assured her, "but you sound very mysterious." "I can't help it," she regretted. "I'm coming upon a mysterious errand, I warn you. We shall be with you soon after eleven." She rang off, and Peter Hames got through the remainder of the day as best he might. Towards eleven o'clock he ordered various suitable refreshments to be placed in his studio, covered over his chest with a cloth, locked the doors leading into the garden, set Leo, his police dog, loose and slipped his small automatic into his pocket. At eleven o'clock the telephone rang once more. Again the voice was Sybil's. "Don't tell me you're not coming?" he groaned. "We're coming," she promised him. "In fact we're almost at your villa now. I forgot to ask one thing, though. Would you mind sending your servants to bed and opening the door yourself?" Peter Hames chuckled. "I'll do it," he said. A quarter of an hour later, the bell in his courtyard sounded gently. Peter Hames placed Leo on guard before the chest, opened the door, and walked down the flagged path. A large limousine was standing at his gate. Sybil stepped quickly out, followed by a small, dark man, slim and apparently youthful. He was bareheaded, and his features were entirely concealed behind a black silk mask. "Don't think we are crazy or melodramatic," Sybil begged, taking Peter's arm, "because I am not going to introduce you to your visitor. I am going to ask you to take him into your studio with me, and to let him talk to you for a little time." "Delighted!" Peter Hames assented. "Please come this way." HE LED them into the villa and across to the studio, opening the door which he had locked and quieting Leo, who had sprung to his feet at their entrance. He wheeled up chairs. "I should like to offer you a glass of wine," he observed, "but I am afraid that your friend is too much handicapped." The stranger spoke for the first time, and his voice, notwithstanding its slight foreign accent, was so delightful that Peter Hames was half ashamed of his momentary irritation. "Miss Christian has told me about you. You are an American gentleman. I am Italian, born unfortunately into a family which is facing troublous times. I shall seem to be terribly confidential with you, a stranger, but I start with the idea that you, being an American, are not greatly interested in European politics, and that you have not, for instance, strong sympathies in favor of one nation over here more than another, and that you are content to let them work out their own destinies." "So far we are agreed," Peter Hames declared. "The countries to which I refer are Italy and France," the stranger continued. "There will probably never be war between us, but we Italians think that France is a little hard upon some of our national aspirations, and that she is inclined sometimes to mock at the whole ré gime of Italy now subordinated to a new power. You probably have heard, and I am not here to deny it, that there are a great many agents of the old ré gime living between here and the far end of the Riviera, whose business it is to keep together in patriotism and national spirit those Italians who have been forced for political reasons to leave their own country." "Very well. Call them that," the other assented. "There are a hundred and twenty thousand of them thoroughly organized between here and Fré jus. They have officials, meeting places. They have definite aims. They have a fixed purpose. The statement of all these, with their names and what they intend to do, is in a chest which found its way in a marvelous fashion into a curiosity shop at St. Paul, and has now, I understand, come into your possession." "A chest with a wonderful lock," Peter Hames remarked. "With a lock which is the masterpiece of one of the greatest workers in metal of the fourteenth century," the stranger continued. "The chest was in my possession always, at one of my châ teaux in this part of the country. A few years ago our enemies in Italy made great friends with the French government, and a strenuous attempt was made to break us up. We discontinued for a time the meetings. The chest was hidden. I shall not tell you the story of its wanderings further than that it was lost through the death of its custodian, who alone knew what it contained, that it found its way into a curiosity shop, and that it is now in your possession." PETER HAMES swept away the cloth which concealed it, and from behind the slits in the mask there came a glow into the eyes of the man who saw it. "That is our chest!" he exclaimed, in a tone of immense relief. "It contains, I should tell you, Mr. Hames, enough evidence for Italy to insist upon the extradition of at least fifty men whose lives would probably be forfeited. You in England have had your Cromwell. You have had your brief periods of politicians who have differed from the government, and have faced death rather than abandon their principles. So it is with my friends whose names are in that box. One moment," he went on, drawing a chain from his pocket. "Perhaps you have never seen a key of gold. There is one here. It is the only key in the world that can unlock that chest. You will allow me to prove my words?" "It is unnecessary," Peter Hames assured him. "I come now to the most difficult part of my task," he said. "When Miss Christian here told me of your rank in life, and your status, Mr. Hames, I was almost sorry. I would rather you had not been one of us, that I might have offered you my check-book. We could have spoken of a million francs, or five million. The lives of my friends, and the lives of those who love Italy, my country, are in that chest." "I'm afraid," Peter Hames apologized, "that unless you will permit me to ring up some of my servants, you will have to help me to carry it out to your car." "You will part with it?" the mysterious visitor cried eagerly. "With the utmost joy," was the prompt assurance. "After what you have told me, it is yours." THERE was a brief silence. Sybil gripped Peter Hames by the arm. "You have spoken of money, sir," Peter Hames reminded his visitor. "As a matter of fact, you really owe the return of your chest intact to a starving painter whose household goods I saved a few days ago from being dragged out of the farm in which he lives. His name is Froydshen, and I can assure you that he has talent. If one day you would drive up to his farmhouse amongst the hills—Le Manoir, one mile from Gournon—if, without a word of explanation, for he is proud, you would ask to see some of his work, would offer your patronage, and perhaps buy an odd picture or two that pleased you, you would perform a very humane action, and you would repay both him and myself for any slight service we have been able to render you in connection with your chest." Peter Hames' mysterious visitor grasped his hand. "It is a great gesture," he exclaimed. "Your painter's career is in my keeping. Now, sir, if you will permit me, we will drink a glass of wine together."